The Moyleman is a marathon covering the downs around Lewes, which we organise in memory of Chris Moyle, whose running nom de guerre was the Moyleman. When I arrived at Moyleman headquarters on the morning of St Patrick's Day, Ash, our founding Race Director, greeted me with a mischievous smile and a tray of shot glasses containing grey sludge. These, he told me proudly, contained a smoothie he had made in honour of the day, the fifth full running of the race. I sipped, cautiously. Ash shares with me an admiration for the writing of Hunter S Thompson, who would breakfast on mescaline and cocaine, and I feared he might have copied the master. It tasted rather as I have always imagined the pick-me-ups Jeeves made for Bertie Wooster might taste, "gentlemen have told me they find it extremely invigorating”. Ash told me it contained blueberries, pear, chia seeds and phoenix guano, though I might have misheard that last ingredient. We had marked the course the day before, in considerable winds, but not in the blizzard conditions we’d had in 2018. By the morning of St Patrick's Day, the winds had abated, it looked as if it would be fine and miraculously many of our signs were still up. At 9 I gathered the marshals for a briefing, while the Wallands school hall began to fill with runners. I used to stand on the stage to deliver my briefings, but since that unfortunate business at the Seaford Striders New Year's Day run, I though it safer to stay at ground level. I delivered it more or less coherently, and the marshals allocated to early spots on the route went off to their places. The rest of us stayed to witness Duncan the Race Director's briefing, which included tributes to Naomi, a Moyleman stalwart who has a stem cell disorder, in recognition of which we made a donation to the Anthony Nolan Trust, and Helen Todd, who chose the Moyleman as her hundredth marathon. Then we shepherded the runners across the A275 to the start at Landport Bottom. Duncan started both the full race, and the relay runners and dogs who start 15 minutes later, in expert style. My plan was to take myself down to the finish, where I would monitor the progress of the race as marshals reported from around the course. But first I had to deliver one of the distinctive purple Moyleman tabards to the marshals high above Firle, at Firle Bostal, and Bo Peep. I accomplished this, but realised that there was no marshal on the water point at the foot of Bo Peep Bostal, probably due to my disorganised approach to the deployment of marshals around the course. I decided to man it myself. There are worse places to be. 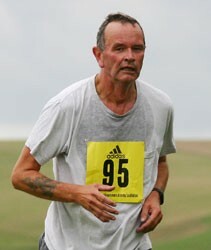 The lead runner, James Turner of Lewes AC, passed me very soon, going at a fine pace. Though at my point he turned to run into the wind, this slowed him not a bit and on he went to set a new course record of 2:52:39. The next runner was some minutes behind him. I’d filled cups diligently, but a large number of runners were carrying their own water containers, which I was happy to refill. Unfortunately, these hold rather more water than the paper cups we use, and I ran out of water before the last runners came through, but they took in in good part. At the end of my stint, the indefatigable tail bikes arrived, and I went on to check on the marshals in Firle and Glynde. All were well, and happy to stay at their posts, so I did a short stint at the tunnel under the A27, and headed back to the finish. Here there was still beer and pizza to be had, runners finishing and marshals coming in off the hills. Each received a wristband, beer and pizza tokens, if they wished, a free massage, and, in the case of runners, a handshake or embrace, according to taste, from the Race Director. As well as the course record falling, the first lady, Jade Elphick of Portslade Hedgehoppers ran the second fastest ever women's time in her first marathon, and the relay team record fell to Chris Coffey and Adam Vaughan of Lewes AC. I hope a good time was had by all. I think it was. Even the runners I saw suffering out on the course did so with the gritty cheerfulness characteristic of those who run long distances on the downs. I’m proud to be a part of this race.